City of Lies is a true gem of fantasy literature. Sam Hawke has woven a tale so unique and refreshing it was an absolute pleasure to read. The story centers on two siblings. Best friends to the Chancellor’s Heir, they are also his shield: Jovan his proofer, trained to detect and neutralize all types of poison, and Kalina who employs other…skills. When the Chancellor is murdered and the city besieged it will be up to Jov and Kalina to identify the traitors in their midst, before everything they love is destroyed. This story is so brilliant, so wonderfully written I couldn’t put it down. I had to know what was going to happen next. 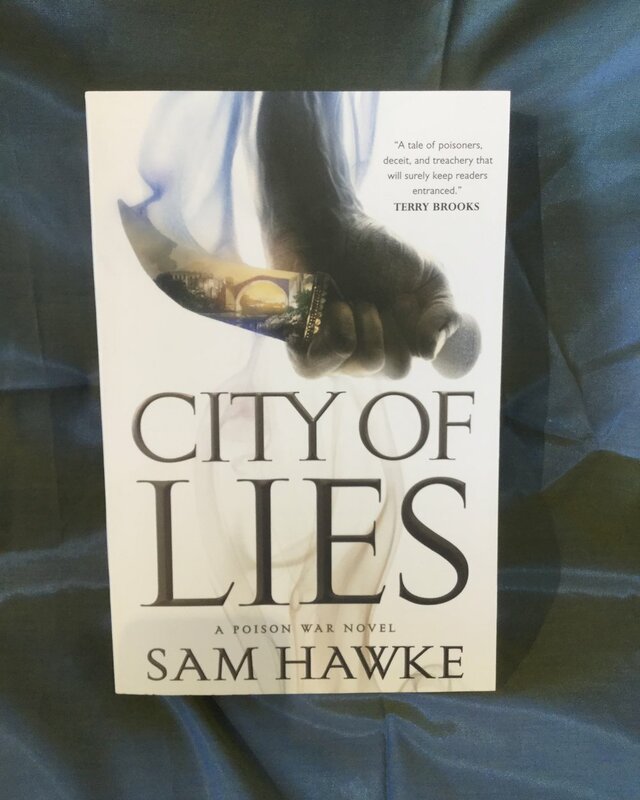 City of Lies is the next must-read fantasy epic for any fan of the genre. Pick up your copy in store today, or order online HERE. Check out this, and Kristi’s other reviews, on here BLOG. Between 1920 and 1950 the Tennessee Children’s Home Society changed the face of adoption forever. They turned adoption from a shameful, embarrassing thing to something Hollywood stars and Government representatives were proud to do. They were also stealing beautiful, poor children to do so. This is the story of twelve-year-old Rill Foss, and her siblings, taken from their poor shanty boat parents and put into the adoption system. The book switches between this time and the time of their future descendants, who are looking for links, and looking for the truth, afraid of what they will find. A fictional novel, based on true events, this book will keep you turning the page, and contemplating the outcomes of such an event, long after you have turned the last page. Pick up your copy today, or order online HERE. 2018 was an amazing year for POC women authors with so many fantastic books coming out. Tasha Suri’s Empire Of Sand is no exception. I’ve been following people on Twitter who follow Tasha, and have been watching the hype for Empire Of Sand build. It was because of that hype that I decided to order the book, and am so glad that I did. Mehr is the illegitimate daughter of an imperial governor, daughter of an Amrithi woman. The Amrithi are desert people, nomads descended from the daiva, who hold magic in their blood. Raised as a noblewoman, Mehr is unprepared when her power comes to the attention of the Maha and his mystics. She will need to use every ounce of wit and will she possesses to escape the cruel clutches of a madman. This is a beautifully written story of inner strength, faith and, above all, hope. I was completely enchanted and swept away with the story as Tasha wove her magic with words. It is a wonderful story set in a world rich in magic and myth. A must-read for all fantasy fans. Ten-year-old Doris receives an address book from her beloved father. Soon after, she is torn from her family. She continues to document every important person who comes into her life, logging them carefully into the address book. Now she is 96 year old, flipping through the pages and remembering every person, where she was when she met them, and how they changed her life. She decides to write down the stories of these people, and how they came to be a part of the fabric of her life, for who she thinks is the last living person in her address book. Not only is the story of her life intriguing and so very interesting, we discover she still has some living left herself. Reserve your copy of this amazing title HERE. One of my goals in 2019 is to try to read more ARCs and be a bit more up on the new releases of the year. My first book for this goal is Crown Of Feathers by Nicki Pau Preto, a Canadian YA author! Veronyka is a war orphen who dreams of nothing more than to become one of the legendary Phoenix Riders, bonding with a Phoenix of her own and being a great warrior and hero. After a stunning act of betrayal by her sister, Val, Veronyka sets off on her own to find the warriors, convinced that they weren’t all destroyed in the Blood War. She succeeds, but runs into one little snag…they are only accepting male recruits. So Veronyka becomes Nyk and gets a position in the stables while seeking a sponsor for the next round of recruitment. What could go wrong? Just her sister suddenly showing up ready to destroy the life and friendships Veronyka has started to build. Just an army of Empire soldiers with orders to destroy the Phoenix Riders once and for all. I will admit that I had some issues getting into this book. I’m not sure if I was finding the story a little slow, or if I just wasn’t in the right head space when I started (it happens). In any case I pushed through, and am so glad I did. In the second half the book really took off and I very much enjoyed where the story went and the twist at the end. I appreciated the fact that, while the story felt properly completed, it also left a lot open for a sequel. I find that this is always a good thing as YA readers tend to enjoy series more than stand-alone books. This one will definitely be going on my recommendation list once it is released in February 2019. Can’t wait to start handselling! Crown of Feathers is available starting February 12th! Get your copy HERE! I follow a bunch of authors I like on twitter. I enjoy their musings on writing, and hope to pick up a tip or two that I can use someday. One of these writers, Mark Lawrence, ran a contest for a signed copy of Red Sister, the first book in his Ancestor trilogy. I won (much to my surprise, as I never win ANYTHING). I have never been so happy to have had a book fall into my lap. While I knew of the book before this, it hadn’t registered on my radar (I have so many on my TBR pile I’m trying to be selective). I was so wrong to not have picked it up before now. I can’t remember the last time a book left me completely speechless! Nona Grey has come to the Convent of Sweet Mary, saved from the noose at the last moment, destined to become a Red Sister, a warrior like none other. But greater things are in motion, things that will change the world, and Nona in the centre of them. Will this girl, plucked wild from the Grey, learn to control her own power and become the warrior she is meant to be? I cannot begin to express my love for this book. The story is amazing and has left me aching for the next book (Grey Sister is available in hardcover, but I have a thing about having books match and so I’m waiting for the mass market edition to come out) so that I can continue following Nona’s story. If you read one great epic fantasy this year, make sure it is Red Sister by Mark Lawrence. I promise you won’t be disappointed! Professor Harari has the gift of writing as a novelist might. In this immensely ‘readable’ work of how we humans tend to make a mess of everything, one can only be left to wonder: will we survive? In The Great Alone, PTSD suffering Vietnam vet Ernt Allbright drags his family to a remote corner of Alaska, believing living fresh off the land, with few people around, will cure him of his nightmares and violent outbreaks. However, as winter approaches and the dark sets in, his wife and daughter find themselves in an increasingly dangerous situation. Alaska itself comes alive in what is essentially a coming-of-age story for the protagonist, Leni. The descriptions are so vivid that you feel as though you are there - which is at times exhilarating and at times terrifying. With a wonderful set of characters, as thoughtful and serious as they are quirky and kind, this book will keep you turning page after page wanting to know what happens to them all. This book, about what it means to belong somewhere, and to someone, will break your heart and lift you up. Richard, a Classics Professor, is caught up in finding a way to move forward in his new life as ‘retired’. Then he sees a piece on the evening news, about African migrants on a hunger strike. Out of curiosity, he makes contact wit the men, and his whole world begins to change. We meet Fran Stubbs, a seventy something woman who is “…already too old to die young and too old to avoid bunions and arthritis, moles and blebs, weakening writs, incipient but not yet treatable cataracts, and encroaching weariness.” This novel is a very skilled mediation on old age but Fran is feisty and continues to enjoy her job with a charitable trust that involves driving to various sites of sheltered housing for the elderly throughout England. This low-key story with well-drawn characters has its share of tragedy and humour, with a few surprises along the way. The book title was drawn from a D.H. Lawrence poem - “Love on the Farm”. This novel is part multi-generational saga, part historical fiction, part magical realism. It is set in 18th century Newfoundland and follows two families over the course of two centuries. Crummey has an amazing facility in capturing the language and atmosphere of the world in the fictional outport of Paradise Deep. From the outset, when a man emerges alive from inside a beached whale the tale only gets more intriguing, compelling and fantastical. The Godfather meets Asia meets magic. Jade City takes us to Kekon, a small island nation struggling to make its way into the 21st century and take its place in the world after years of war and invasion. Run by powerful Green Bone families, Kekon has one thing everyone wants: Jade and the ability to wield its magic. With a new drug making the rounds that allows anyone, even foreigners, to use jade magic and political strife between the Kaul and Ayt families, Kekon is about to be shaken to its very core. Fonda Lee makes her debut into adult fantasy fiction with this fresh and exciting new world. And don’t forget to watch for book 2 of the Green Bones Saga: Jade War out in hardcover May 2019! Florence is 84, living in an assisted living complex with her best friend from childhood, Elsie, living nearby. When she thinks she recognizes a new resident as someone from her past, she is disturbed. Odd things happen, and the staff assume that she is just a dotty old lady, but is someone really out to get her? How often does a book thrill you? I mean electrify, frighten, excite, and confuse you from the sole of your feet to the top of your head? Imagine a genetic mutation suddenly activated in every woman and girl, giving them the kind of physical primacy over men that men have always had over women? How would that change the world? currently available in hardcover. The paperback edition is available for pre-order now, available in stores January 2019. In this wonderful memoir, Craig Davidson is a writer who has reached rock bottom. After a brief glimpse of what life could have held for him as a successful novelist, his book bombs and he falls into self-pity and doubt. Eventually he runs out of money and, in desperation, takes a job driving a school bus: a 'short bus', at that. What begins as an impulsive decision, a way simply to make some money, ends up being an experience that will help Davidson grown, like none other. Davidson becomes these kids' driver, their defender and champion; however, it is these kids that are the true heroes. This book will keep you laughing, grinning, crying and growing. Without ever being condescending, or sappy, without being depressing, despite its sometimes serious subject matter, Davidson has hit every mark right with his wonderful book. Craig Davidson's latest novel, Cataract City was short-listed for the Giller Prize and Trillium Book Prize, while his book of stories, Rust and Bone, became a Golden Globe-nominated film. Precious Cargo was short-listed for Canada Reads 2018. He also writes thrillers under the pseudonym Nick Cutter. Reserve your copy of Precious Cargo here. A fascinating look at the world of cutting-edge geneticist George Church and his team of Harvard researchers. Known for their work on the Human Genome Project, the Church lab is at the forefront of genetics research and technology. The Woolly Project is just one of the many. In this case, the Woolly Project seeks to clone and reintroduce the Woolly Mammoth into the world (kind of like Jurassic Park, but without the man-eating parts). It is hoped that the mammoths can help stabilize the melting of the polar ice caps and reduce the effects of global warming. A very readable modern science book that raises lots of great discussion questions. A perfect non-fiction read for book clubs. For readers who want something interesting, but not too dark, this beginning novel of rural England will strike chords of similarity to Agatha Christie’s world. However, Max Tudor is a former secret agent turned village priest, so he is even less innocent than Miss Marple. Intriguing stories, and even more fascinating characters. In the UK's first post-Brexit novel, Ali Smith conjures a literary stream of consciousness through Elizabeth Demand, a thirty-something sessional college instructor struggling with economic, emotional, and existential insecurity in an England very different from that of her childhood. The story hinges on her relationship with her mother, and daily visits to Daniel Gluck, an elderly gentleman sleeping away his final days. The first in a seasonal quartet, and finalist for the 2017 Man Booker Prize, Autumn is an exquisite study of fleeting things. Book 2: Winter will be available in paperback on November 6, 2018. Preorder your copy here. Book 3: Spring will be available in hardcover on March 12, 2019. Preorder your copy here. This is an excellent book! I liked it even more than Half Blood Blues by this author. Washington Black is born a slave on a plantation in Barbados. Mistreated and only ever knowing a life of work and fear, Wash is even more terrified when two brothers come to take over the plantation. He is moved away from the fields and all he’s known and put into the home of Christopher Wilde, the younger brother. To his surprise, he has been given to a scientist. He is taught to read, write, measure, and look at the world in a way that makes him the perfect assistant to Wilde. Wash also discovers a talent he has for drawing and it is through their shared passion for the natural world that the two form a bond. However, these were terrible times, and when a white man ends up dead with Wash as a witness, the two have to decide how far they are willing to run for each other. It indeed takes them to the very ends of the earth, pulling them together and wrenching them apart. This novel explores ideas of freedom, intention, systemic racism, and of the lengths we will go to try to rebuild broken lives. Washington Black has been shortlisted for the 2018 Man Booker Prize (to be awarded October 16th) and shortlisted for the 2018 Scotiabank Giller Prize (to be awarded November 19th). This is a great memoir in an appealing, easy to digest, graphic novel style. It is ultimately an adorable love story: a love story between the author and her husband and also the author and herself. Andrea one day meets and falls in love with a plastic surgeon. This sends her back to her teenage self and the all of the insecurities she has over her large nose. She struggles with loving him and not loving the message that she feels his profession gives to women everywhere. She revisits her own experiences in adolescence of being teased for her appearance and her battle between wanting to change how she looks and accepting herself as she is. The ultimate lesson is that often what makes us stand out is what makes us unique. In this mystery book, two women, who don’t really fit in to the community of their sons’ private school, become the best of friends very quickly. However, both of them harbor terrible secrets about their pasts. What can be forgiven and what is completely unforgivable? This book was a quick, easy read with an interesting enough story line that kept me trying to piece together who was going to be who in the end. The chapters flipped from the point-of-view of one of the women, to the other woman’s daughter, to a character just named “DJ” who seemed, at first, to have nothing to do with the story taking place, but added to you trying to guess things about each woman. Anyone interested in the Karla Holmolka story would probably be interested in this.